set a bird loose 鳥を放つ. She shook my arm loose. 彼女は私の腕を振りはらった. I'm finally loose of her. ついに彼女から逃れられた. The screw has come loose. ねじがはずれた. loose coins [cash, change] ばら銭, 小銭. a loose leaf とじてない[抜き差し自在の]紙, ルーズリーフ. I keep my money loose in my pocket. 金をばらでポケットに入れている. This dress is a bit loose on me. このドレスは私には少々大きめです. in loose order 【陸海軍, 軍事】 散[疎]開隊形で. I'm loose in the bowels. 下痢している. in a loose sense 漠然とした意味で. a loose tongue 軽い口, おしゃべり. 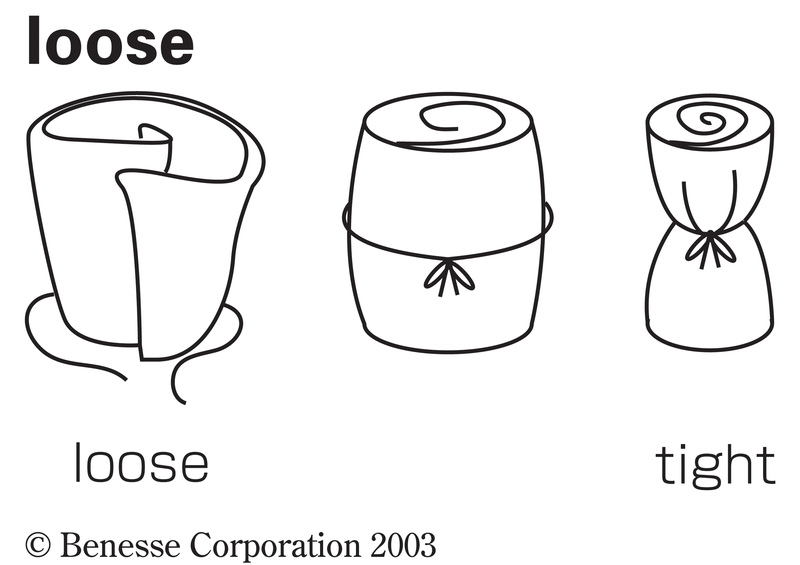 have a loose tongue おしゃべりである. 〈人・言動が〉(道徳的に)ずぼらな，不身持ちな 《★【比較】 日本語の「ルーズ」は生活態度のだらしなさにいうが，英語の loose は道徳的な意味に用いる》. lead a loose life だらしのない生活をする. loose one's hold (of [on]…) (…から)手をゆるめる. Don't let a dog loose on the crowd. He always has some loose coins in his pocket. He always wears a loose coat to hide his figure. It is dangerous not to fasten a loose bolt. I had my loose tooth pulled out. I spent a loose life when I was young. If you are at a loose end, please help me with my job. The space shuttle cut an engine loose from its body in order to gain height. After two weeks of negotiations, the terrorists decided to set the hostages loose. The bank robber is still on the loose. The prohibition law loosed the Mafia's grip in America. The father loosed his son's clutch. Check that the plug has not come loose.